This is the end of week 2 of the challenge and Rosabelle is doing very well in her job, Pawel is also progressing and he brought many great skills into the household when he moved in. Today is both or their days off so they will be spending some quality time together. Pawel fixes the toilet that broke last night when he get up this morning. He earns a handiness skill point for it too. Afterwards Rosabelle and he eat a breakfast of free yogurt. Today is day 13 in the Prospero house, the number 13 is considered unlucky by some of Rosabelle’s older family members. She has never paid much mind to it but today turns out to be a pretty unlucky day. Pawel wakes up this morning in dire need of a shower, even he thinks he stinks. He jumps in the shower immediately. Rosabelle and Pawel are now living together, this means that Pawel can start contributing to the household funds and help to earn a million simoleons! Pawel Lawton really came into the Prospero family loaded with great skills. He has a little cooking ability, he can paint and play the guitar (if they actually had those items) and he even knows some mixology! Rosabelle gets up late for work this morning, so she quickly eats her breakfast (free yogurt again) . Unfortunately she doesn’t have time for a shower this morning. She does however find time to browse art in the computer for inspiration before going to work. Now that Rosabelle has a wonderful new house, she can start really working on finding a spouse to spend her life with. She needs to start a family in order to complete her goal of §1,000,000 simoleons because she will no be able to complete that in her lifetime. The second day in Rosabelle’s new house starts off much better than yesterday, today is also her official day off even though she took a paid vacation day yesterday. She wakes up inspired this morning and feeling very well. After Rosabelle’s usual breakfast of yogurt, she plays a bit of Sims Forever and then begins writing a new book. Rosabelle now has the amazing luxury of a HOUSE! She has a bathroom and table with her computer and an extra chair…for someone special maybe? She wakes up this morning not under the open sky with the raising sun, but instead in a warm room in her home with a shower of her very own to use. Well Rosabelle is really going to need that new shower because she woke up filthy, hungry and uncomfortable from being so grungy. She immediately takes a shower to wash off the disgusting filth. Look at that stinky armpit! Rosabelle is getting more successful, she has gotten a computer for free from a promotion but she has nowhere to use it yet. She has been fantasizing about what it would be like to have a roof over her head, this is also a necessary requirement to ask someone to move in if she wants to. The morning breaks bright and early for Rosabelle, she doesn’t have anyway to block out the sunlight so she is usually up with it, she is hoping to get in some extra writing practice at the Library before work so maybe she will get another promotion. Rosabelle wakes up tense from being uncreative and she gets her morning breakfast of (free) yogurt. She likes to slam the door in the morning when she is tense, I am worried that her cheapo fridge is going to break if she keeps doing that! Rosabelle then goes to the library before work. The Library is amazingly peaceful and quite this early in the morning. She hope to get in 4~5 hours of writing practice in before she has to go to work. 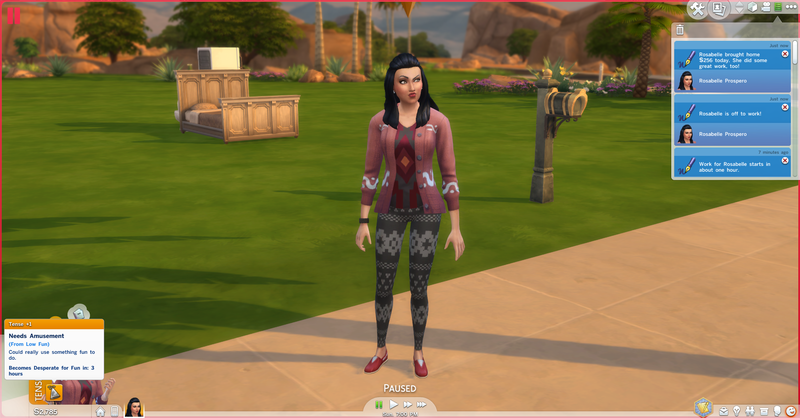 Rosabelle has completed one week in her new home in Oasis Springs and she has broke §1000 simoleons but she is still very far away from §1,000,000! She has also met a potential partner for her and is very excited about that. Rosabelle wakes up hungry as usual and eats yogurt for breakfast. At least she woke up in a good mood today. Rosabelle had woken up later than usual so she did not have time to shower or anything other than to eat breakfast before she goes to work. She returns home in the afternoon with §256, her funds are now §2785. When she gets home she is tense from low fun.